This has been an unexpected productive day photography wise for me. It had just snowed yesterday, so the ground is coated with fresh snow. Now a couple weeks ago, we had a storm that dumped a significant amount of snow as well. 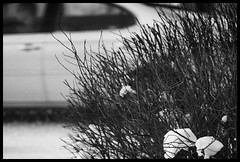 Being that I had my new camera, and this was my first snow photography series, I was more than ready to "lug" the camera. At the last moment , I grabbed my equipment and headed off to work.